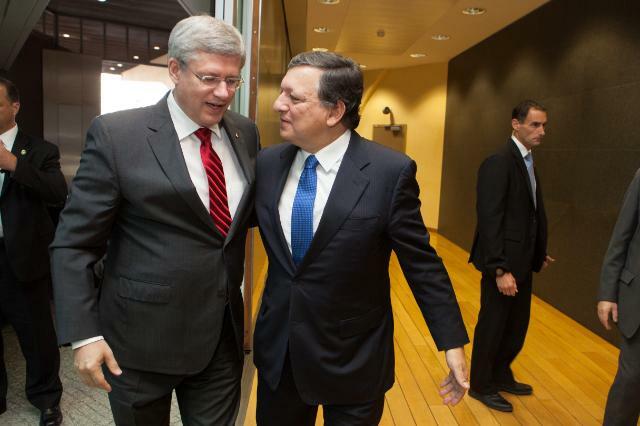 José Manuel Barroso, President of the European Commission (on the right), received yesterday Stephen Harper, Canadian Prime Minister. They together reached a political agreement on the key elements of a Comprehensive Economic and Trade Agreement (CETA) after months of intense negotiations. (EC Audiovisual Services, 18/10/2013). The announcement of the conclusion of the EU-Canada free trade agreement yesterday not only opens a new chapter in the history of EU-Canada relations, but the solutions agreed in sensitive chapters, like agriculture and animal products and public procurement will serve as a base for the under negotiation similar pact with the US. The Prime Minister of Canada, Stephen Harper, was in Brussels yesterday and signed a common declaration with the President of the European Commission, Manuel Barroso, entitled, “A new era in EU-Canada relations”. The agreement provides that both sides will fully eliminate tariffs on more than 99% of all tariff lines. Agricultural products and foodstuffs is another very important chapter of the agreement. According to this chapter, by the end of the transitional periods, Canada and the EU will liberalise, respectively, 92.8 % and 93.5 % of trade in agriculture. There are also other important sectors covered by the agreement like the automotive, public procurement, non-tariff barriers, recognition of qualifications and investment protection. Given that both economies are advanced, the trade in services accounts for almost half of the total. GDP gains for the EU only from this sector could amount to up to €5.8 billion per year, once the agreement is fully implemented. Investments remain the most important mechanism through which services are delivered and manufacturing may be carried out. In 2011, the EU’s investment stock in Canada was around €220 billion, while Canadian investment in the EU amounted to almost €140 billion. It’s very interesting to mention that the agreement provides for protection of special European foods that are not covered by the existing arrangements. In this respect Canada will recognise Geographical Indications for a long list of European agricultural products from a specific geographical origin, so-called Geographical Indications (GIs). According to a Press release issued after the joint Barroso- Harper declaration gives characteristic examples of GIs names to be protected by Canada, as for example the Greek Feta cheese , Grana Padano, Roquefort, Elia Kalamatas Olives and Aceto balsamico di Modena. The agreement also offers the possibility to add more products’ names to this list in the future. In addition, some prominent EU GIs such as Prosciutto di Parma and Prosciutto di San Daniele will be authorised to use their name when sold in Canada, which was not the case for more than 20 years. Concerning the other major EU trade endeavour in North America, the Transatlantic Trade and Investment Partnership (TTIP) with the United States, the talks started with a round held on 8-12 July 2013 in Washington, D.C. . However, the second round scheduled for 7-11 October in Brussels never took place. The US Administration was not able to send to Brussels officials from USTR and other US Government agencies, due to the shutdown of the American civil services. Now that the US administration is again operational, the two sides will plan the continuation of talks. The EU has also started negotiations for trade agreements, with its other key trading partners. Yesterday, 18 October, the Council adopted a mandate asking the European Commission to start investment negotiations with China. The main targets of these negotiations are the progressive abolition of restrictions on trade and foreign direct investment. The EU has opened trade negotiations also with Japan, the ASEAN countries of south-east Asia and the Mercosur countries of Latin America. As for the Southern Mediterranean countries, the EU has launched negotiations with Morocco, for a Deep and Comprehensive Free Trade Agreement (DCFTA). The Commission also has a mandate to start a similar process with Tunisia, Egypt and Jordan. Coming back to Europe, though, things are not so bright. The EU has recently concluded negotiations for a Deep and Comprehensive Free Trade Area (DCFTA) with Moldova, Armenia and Georgia, but none of these has been applied yet. In the case of Armenia, the country decided all of a sudden to join the customs union of Russia, Belarus and Kazakhstan, abandoning the prospect of a trade agreement with the Union. All in all, after the break down of the Doha round of negotiations for a new global trade arrangement (multilateral) under the roof of the World Trade Organisation, the US and the EU have taken the bilateral way. The break-down of the WTO option is charged to the US, because Washington abruptly abandoned the Trade Round of Doha two years ago. In view of that, the EU is now actively pursuing the option of signing bilateral agreements with key countries. Obviously bilateral negotiations favour the most powerful trading partners like the US and the EU. Probably this is why the US didn’t want to follow the WTO option.